LANDIKOTAL: A renowned young religious scholar Adnan Qadri addressing to a condolence reference for Hazrat Sheikh Gul Sahib (R.A) in Landikotal. LANDIKOTAL: To pay a rich tribute to a renowned spiritual leader Hazrat Pir Sheikh Gul Sahib, a condolence reference held in Jamia Junaidia Gul Wali in Landikotal of Khyber district. 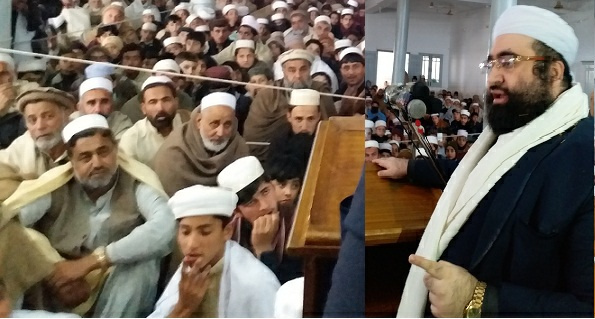 A large number of people including monumental scholars and followers of Pir Sheikh Gul Sahib took part in the gathering. Addressing on the occasion a renowned religious scholar Adnan Qadri said Hazrat Shaikh Gul Sahib was always kind and humble for all and those who used to come to him for any kind of help. He had devoted his entire life for Shariat-e-Mohammadi and for his followers to guide them on the straight path. Qadri expressed that he could never be forgotten and would be remembered his service for the peace and uplift of the followers in the golden word. The others who also paid tribute to the services of Shaikh Gul Sahib included Maulana Taj Ali, Maulana Sardar Shaireen and Mufti Asmat Rahman. To convey Rewards to the deceased Pir Sahib Mubarak, Quran Kareem was recited for 23 times in the gathering. A contest in five languages was also conducted on the occasion in which 16 students the seminary took parts. Later, Adnan Qadri distributed prize among shining students. It is noteworthy to mention here that Abdul Aziz alias Sheik Gul Sahib born in a renowned spiritual family of Landikotal in the home of Hazrat Haji Gul Sahib in Pirokhel village in 1932. He received his initial Islamic education from his father Hazrat Haji Gul Sahib while he was later sent to Haqania seminary in Akora Khattak. He completed his Islamic education in Haqania Madrassa and returned to his village to start his practical life. He spread peace and love among people. Pir Sahib breathed his last after protracted illness laid to rest in Pirokhel village on December 26, (Wednesday) in Landikotal subdivision of Khyber tribal district.